I have previously mentioned my small crush on Israeli couscous and imagine my excitement when I recently stumbled upon whole wheat Israeli couscous. The small pearls are larger and denser than regular couscous. It’s healthier than pasta, absorbs flavors more and the additions are simply endless! 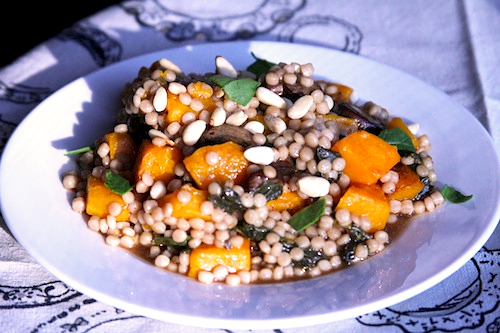 This recipe can be made with any grain – barley, farro, whole-wheat regular couscous and more. Simply prepare the grain according to the package instructions. Preparing grains with half broth and half water helps infuse just a little extra flavor than just water alone. A little crunch on grain-based dishes always appeals to me so I added toasted pine nuts but toasted pecans would work very well also in this dish. As a timesaving step for this busy family, I buy the pre-diced pre-peeled squash that is readily available. Spinach leaves are filled with flavonoids, which may have antioxidant properties, and are high in vitamin K.
Using whole wheat Israeli couscous is a great option as it yields the benefits of whole wheat combined with the quick cook time for which couscous is known. This is a much deeper, nuttier flavor than the processed version. This recipe can be made with any grain – barley, farro, whole-wheat regular couscous and more. Toss squash with 1 Tablespoon olive oil and place on baking sheet. Sprinkle with salt and pepper and roast until soft and softly caramelized (30 minutes), then set aside. Prepare your choice of grain and follow package instructions. If using whole wheat Israeli couscous, boil 1 cup of water and 1 cup of broth. Add 1 cup dry couscous and cover at a low simmer for 10 minutes. While your grains are cooking, heat 1 tablespoon of olive oil in a heavy pan over medium heat. Add mushrooms, salt and pepper and sauté until the mushrooms have released their liquid and are subtly browned. Add garlic, chicken broth and balsamic vinegar. Cook for about 2 minutes until liquid is mostly absorbed, then stir in thyme, orange zest and spinach leaves. Once spinach leaves are slightly wilted, remove from the heat and add couscous and butternut squash to the pan.